No one outside of Apple knows what the next iPhone will look like - and even that is privy to a select few - but a new report makes some bold claims about the iPhone 5 (or is that "new iPhone")? Forget about those rumors of a liquidmetal casing, or mockups showing a teardrop-shaped design - the next iPhone may not look all that different from the current iPhone 4S. A published report claims that Apple will slim down the next iPhone by as much as 2mm, while stretching it to be 10mm taller at the same time. The result of these subtle changes would allow the company to take advantage of the additional screen real estate to increase the display from 3.5 inches to four inches instead - a move that would make watching HD videos more appealing, doing away with the black bars at the top and bottom. A number of recent rumors speculate that Apple may try to reduce the size of the 30-pin dock connector that's been in use on its mobile devices for years, in favor of a more efficient, space-saving design. The new dock connector is described as "closer to a pill shape," and the report continues to speculate that the connector will eventually find its way to all of the company's iOS devices. 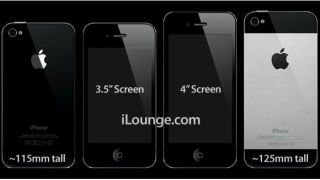 While no one knows for sure if Apple will call the device the iPhone 5 or simply "the new iPhone," the source also claims the back of the handset will feature a flat, metal panel between the camera and the bottom, which will otherwise retain a look reminiscent of the existing iPhone 4 and 4S models. As always, it's a good idea to take this kind of rumor with a grain of salt - especially when the new handset isn't expected until October at the earliest.